Tibetan women stand at the foot of a glacier in 2007. Sharp increases in temperature driven by global warming are melting China's Himalayan glaciers, an impact that threatens habitats, tourism and economic development, says a study released Tuesday. 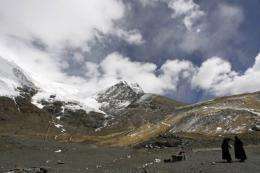 Sharp increases in temperature driven by global warming are melting China's Himalayan glaciers, an impact that threatens habitats, tourism and economic development, says a study released Tuesday. Of 111 weather stations scattered across southwestern China, 77 percent showed significant upticks in temperatures between 1961 and 2008, according to the study, published in a British peer-reviewed journal, Environmental Research Letters. At the 14 monitoring stations above 4,000 metres (13,123 feet), the jump over this period was 1.73 degrees Celsius (3.11 degrees Fahrenheit), roughly twice the average global increase over the last century. Researchers led by Li Zhongxing of the Chinese Academy of Sciences identified three changes occurring in glaciers that could be caused, at least in part, by this steady warming trend. Many of the glaciers examined showed a "drastic retreat" as well as large loss of mass, they reported. The Pengqu basin's 999 glaciers, for example, had a combined area loss of 131 square kilometres (51 square miles) over two decades, from 1980 to 2001. The study also showed that glacial lakes -- fed by runoff from melting ice masses -- had expanded in size. "The implications of these changes are far more serious that simply altering the landscape," the researchers warned. "Glaciers are an integral part of thousands of ecosystems and play a crucial role in sustaining human populations." All told, southwestern China has 23,488 glaciers, covering an area of 29,523 square kms (11,399 sq. miles) across the Himalayas and the Nyainqntanglha, Tanggula and Hengduan mountains. Changes in rain and snowfall was less marked, but still consistent with predictions by climate change models, the study found. "It is imperative we determine the relationship between climate change and glacier variations, particularly the role of precipitation, as the consequences of glacier retreat are far reaching," Li said. Thanks for the story. I hope that these Chinese scientists are not ignoring Earth's heat source - the Sun. There is encouraging news from Princeton of studies that may unlock the secret of solar eruptions and changes in Earths climate. We still do not know the role of the Meissner effect in expelling magnetic fields from the surface of the Sun's deep-seated, iron-rich superconductor [Barry Ninham, "Charged Bose gas in astrophysics", Physics Letters 4, 278-279 (1963]. I thought that the sun was a neutron star. Now you're saying it has a superconducting iron core? Stop it, man -- you're freaking me out!